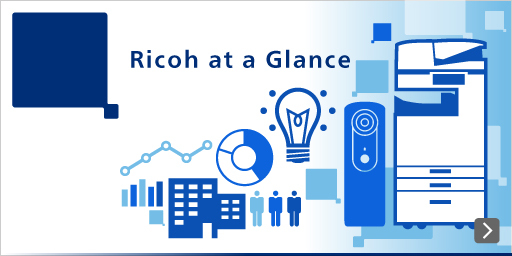 Ricoh is promoting a unique innovation in the development process, aiming to provide customers with timely products and services, and to respond quickly to market changes. We continually strive to improve development efficiency, to assess technology in upper processes, and to develop products without relying on prototypes. This approach, Development Process Innovation, significantly shortens product development time while ensuring higher product quality and reliability. Prototyping used to prevent copiers/MFPs from being developed quickly; it was also a major factor raising product costs. Our unique development process innovation has enabled us to sharply reduce the number of prototypes; it has also reduced prototyping costs per model, contributing to the development of leading-edge products with improved cost performance. Beyond that, it has enabled us to adapt quickly to market changes and trends. 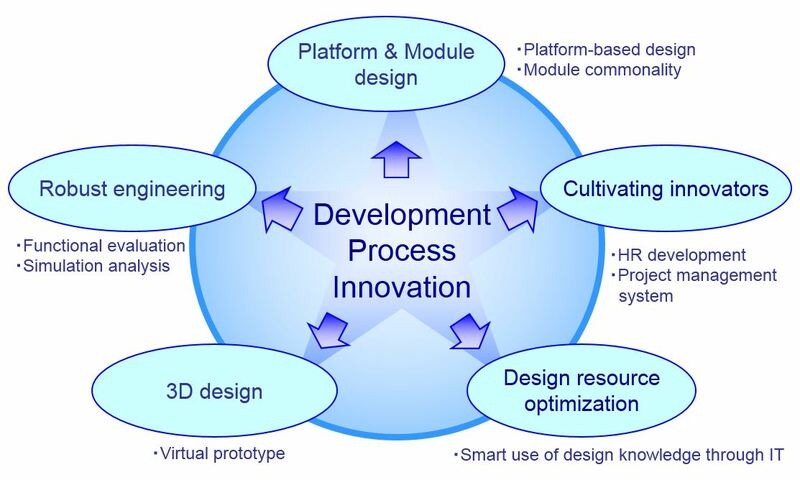 The Development Process Innovation is based on the following five pillars. Utilize functional parts (modules), their integrated units from previous models, or choose among models of different printing speed. This derivative design is the idea behind “Platform & Module design,” and we aggressively pursue this idea. If you design a new module or product, make it highly reliable and ensure quality so that customers can use it over time without worry. A robust product/prototype is tough, strong, and failure-free. To this end, we take a scientific approach that includes functional evaluation and simulation analysis. Computer simulation is an effective alternative to verification by prototype. By fully using 3D CAD and other advanced computer technology, we reduce prototype costs and increase development speed. By building a system in which any designer can acquire design resources immediately, we reduce time costs, aiming at speeding up development. We have introduced systematic human resource development and project management for mid-level engineers; we also introduced a unique training program for newcomers. We train designers to take the initiative to exploit market changes and technical innovations. Development Process Innovation with these five ideas has been proposed to all designers, who are the instruments of this process. The ideas have greatly changed designer mindsets and are steadily yielding results. We spare no effort in developing products without relying on prototypes. We intend to apply this approach to other product fields, and support other manufacturing companies including our business partners. Ricoh will try to accelerate and expand Development Process Innovation to supporting industries, further improving customer service.